Today marks an important occasion for the BBC. Not only is it the 50th anniversary of Doctor Who, with the Anniversary Special "The Day of the Doctor" being aired in celebration, it's also the 678th day in a row without a new episode of Sherlock. Not that we're counting. Dedicated fans may already know that during that time the BBC created a series of character blogs that could be followed along with the episodes, including Sherlock's Science of Deduction and morgue attendant Molly Hooper's (Louise Brealey) cat-covered diary. One of the many ways in which the show was updated for the modern age was to have John Watson keep a blog instead of a journal, and the BBC also created a real-life online counterpart for the website that was shown in the show. During the first two seasons, the blog was regularly updated with write-ups of cases from the show and others that took place in between episodes, but since the traumatic season 2 finale, "The Reichenbach Fall," the blog has gone into hiatus. With the season 3 premiere on the way, however, it seems that John is ready to come out of mourning and move on with his life. But I've been told that I should talk about it. That if I don't talk about it I'll be how I was pre-Sherlock. And I can't go back to that. I've a life now. I understand that he's dead. And I accept it. I still believe in him. In who he was. The truth behind that will come out, I believe that. But Sherlock is dead and that period of my life is behind me. And that's what life is. Things happen. Then they're in the past. And you move on to new things. New people. New friends. New beginnings. But it's also important not to forget the past. And I've found a few photos and a few blog posts I never finished so over the next few weeks I'll be doing that really. Remembering the past. And I won't feel sad about it. Not any more. Because they were good times. We did good and we had fun. And that's what I'm going to remember. My best friend, and he'd kill me for saying that's what he was, is dead. Sherlock Holmes is dead. But, by God, he'll never be forgotten. For some reason, the blog posts don't include the year of publication in the dates, but based on the information given, it looks like the new entry was posted about ten months after Sherlock's "death." The comments are worth checking out for the reactions from John's friends and family, in particular his new love interest Mary Morstan (Amanda Abbington). Since John pledges to write up some of his notes from old cases in the near future, keep a close eye on his blog for further updates. 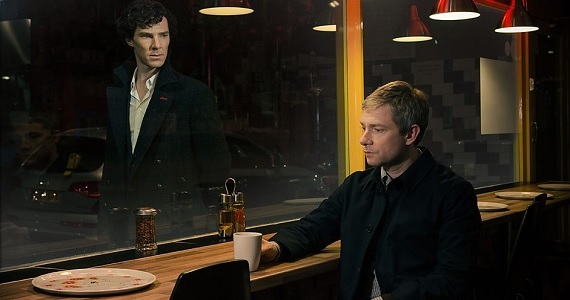 While moving on might be the emotionally healthy thing to do, what John doesn't know is that Sherlock isn't dead at all; a brief scene at the end of the season 2 finale revealed that he had survived the fall from the roof of St. Bartholomew's Hospital, and season 3 will reunite the two friends once more and send them on a spate of new cases.